From October 26-28, 2018, the Los Angeles Convention Center played host to the annual Stan Lee’s LA Comic-Con. Formerly known as Stan Lee’s Comikaze, it followed the lead of other conventions in adapting the Comic Con name when it rebranded in 2016. Although the focus of the convention is on comic books, it also deals with animation and live-action properties. panel. Picture courtesy of Andrew Nguyen. 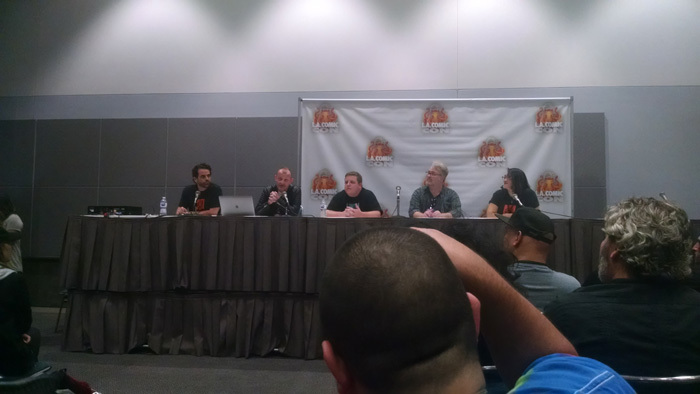 In years past, the LA Comic-Con has held panels that dealt with Godzilla and other giant monster movies. 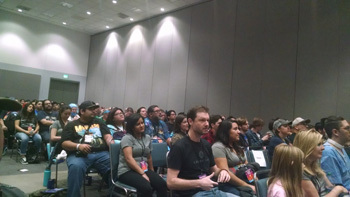 Most of these panels were done by fans of the series, and it would be the same this time around with one such event held on Saturday in the early afternoon. However the 2018 LA Comic Con would also have a panel by Legendary Pictures to promote its comic book tie-ins for the MonsterVerse series, which includes the films GODZILLA (2014), KONG: SKULL ISLAND (2017) and the upcoming GODZILLA: KING OF THE MONSTERS. The panel took place on Saturday. October 27 and featured five panelists — moderator Robert Napton, Barnaby Legg, George Tew, Drew Johnson, and Jann Jones. The panelists first discussed the overall MonsterVerse before focusing on KONG: SKULL ISLAND and the related comic book tie in Skull Island: The Birth of Kong. They showed initial designs for the creatures that would appear in KONG: SKULL ISLAND and designs of creatures that were cut out of the film but instead made appearances in the comic. They then turned to talk about Godzilla with the discussion on the monsters, or “Titans” as they are called in GODZILLA: KING OF THE MONSTERS. 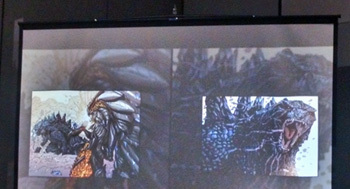 They discussed how the monsters designs were based on real creatures and the view of a natural disaster taking shape with Rodan and King Ghidorah having a particular focus of enormous windstorms and electrical storm systems. The panel then introduced a slideshow of sightings of the monsters including one of Godzilla making his way to San Diego for a special event that took place in July. The discussion then turned to the comic books that are helping to flesh out the films’ crypto-zoological agency Monarch and its history with Godzilla: Awakening, Skull Island: The Birth of Kong and, finally, Godzilla: Aftershock (the prequel comic to GODZILLA: KING OF THE MONSTERS). Some of the inspiration for Monarch came from a now defunct government program called Project Blue Book, which was designed to study UFOs. The panel then turned to focus on Godzilla: Aftershock with a trailer for the new story before the panel discussed the creation of the comic and how to tie the comics together with their respective movies. The comic will include appearances of the characters Dr. Graham, Dr. Serizawa and a new character from GODZILLA: KING OF THE MONSTERS, Dr. Emma Russell. Godzilla faces off against a new original foe that has a connection to the MUTOs from 2014’s GODZILLA and whose design resembled a mix of the MUTOs and Orga from Toho’s GODZILLA 2000. Godzilla: Aftershock will arrive on store shelves in the form of a single trade paperback on April 16, 2019. The panel wrapped with a small quick Q&A with one question regarding whether any new Toho monsters might appear in some form in the MonsterVerse (the panelists couldn’t answer due to legal issues). Asked if any of them had seen Toho’s 2016 film SHIN GODZILLA, most of the panelists stated that they had, with the movie leaving a positive impression on them. The next question was about their dealings with Toho Studios, which seems to be proceeding smoothly as a fruitful relationship within Toho’s standard operating rules. Toho has granted the Legendary production teams a bit of flexibility; rather surprising considering what happened the last time they worked with a studio on an American Godzilla movie. One person asked if they would use the Gryphon, a monster from the aborted 1994 version of the American GODZILLA from Sony Pictures, to which they answered that they really didn’t know much about that film. Other questions included a suggestion for turning one of the MonsterVerse comics into a movie, therefore verifying the comics as canon with the films. After the panel, attendees that came in early were given tickets for posters from the comic book that Legendary Pictures would be handing out at the convention.